So here goes! I’m the only female in this house (dog and cat aside) I have 3 boys with no concept of personal space and a husband who works long hours all week. I also, not surprisingly, have a period once a month. If you’ve read some of my previous blog posts you’ll know I use reusable cloth sanitary pads (CSP). Muff fluff is the term I use and the boys even helped choose the fabric patterns for a few of them (How to train your dragon is their favourite!) – they know I bleed on them and that I use them “like a nappy” once a month. They also know I store clean ones in the bathroom in a wet bag. Loki in particular likes lining them up across the floor when I’m having a shower and tidying them away when they’re dry. My Mum won’t agree here, but if Loki joins you on a bathroom trip he’ll helpfully place a clean muff fluff pad between your legs just in case you might need it. I think my Mum will think twice next time she lets Loki join her in the bathroom! Despite my bathroom door having a lock on it, we loosely have an open door policy in the house. Read this as; I can’t go anywhere alone without a child, pet or both following me. Closing the door on a sad wee pouty face is something I can’t bring myself to do just yet. Although I do often question this foolish decision. I do try to encourage the boys to give me privacy when I’m in the bathroom but that never seems to happen! I don’t want them to think me being on my period is something dirty or abnormal and I’m comfortable being open with them. It is what it is and it is perfectly natural. I don’t feel the need to hide it, or keep it secret. 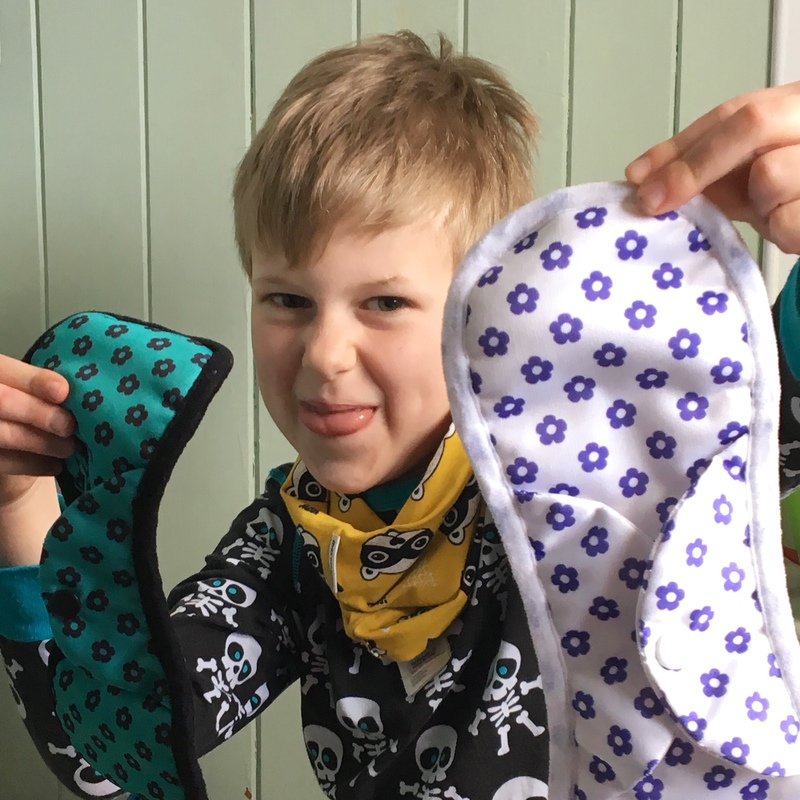 I told the boys it’s not a secret but we just don’t need to talk about (or mortifyingly ask every female we meet if they’re on their period) – it’s just like a trip to the bathroom; you don’t tell everyone you’ve just done a poo do you? There is a good chance I imagine, that they’ll all come across a menstruating female at some point in their lifetimes. I also imagine it is probably in their best interests if they didn’t freak out and act like it was disgusting! Hopefully my honest approach to periods will help them there. Unfortunately this month I came on during the night and leaked all over the bedsheets. (Sake!) If that wasn’t bad enough Oren came in that morning for a cuddle, saw it and immediately freaked out. The poor boy thought I was haemorrhaging and I was going to die. It was a rough start to a Tuesday! Personally, I thought this was hilarious! You have to see the funny side of things like this. However, I saw Oren was genuinely quite traumatised so I tried to make light of it and joked about the mess and made out how funny it looked (clarified I hadn’t killed Daddy or the cat) and sarcastically said what a great start to the day it was. Thankfully he started laughing along with me too and I explained I was absolutely fine and most importantly – not dying! It took some convincing and I was slightly worried about him going to school telling his friends and teachers all sorts of stories but I didn’t want to tell him to keep it a secret or keep quiet so I just hoped I didn’t get a phone call from the school! Another point I feel is important to make here is that I’m not embarrassed by leaking all over the bed (definitely not the only one) nor am I ashamed to share the fact it happened (annoyingly this happens fairly regularly!). Admittedly though, I am very relieved I didn’t get a phone call from the school! Being a Mum of boys I won’t ever have to have the period talk with them but I can at the very least educate them so they know what’s what when it comes to basic facts. As they get older I’ll go into further details when I see fit. I don’t see any point shielding them from the truth – it’s all part of life and growing up. Fantastic blog post – I will be using the same approach with Logan, and any future children – if my period comes back, that is. 13 months since birth and still no sign, I’m half happy because I don’t have to deal with the agony for 10 days, but half annoyed as I really want to try for baby number 2! Thanks for saying so lovely! I do think it’s best to be open about these things and no matter how hard I try to go to the bathroom alone it just never works out that I manage it! I don’t know how any mama can do these things alone, to be honest! They must be magic! This is such a fantastic post. I remember reviewing Bloom & Nora and speaking with the company about how it was difficult to promote csp as people were quite squeamish about periods, never mind csp. Which when I think about it, is ridiculous especially as most of both our readers are women! I love the refreshing attitude you have and you are a wonderful role model to fellow mums of boys. Thank you so lovely of you to say so too. I figure it is what it is no point hiding it just because I’ve got boys I’d rather be open than risk the frightened questions if they discovered it unawares! Another great blog!….love it. I do believe that it’s best to be honest with the kids as well. It is the fairest way.